socks, under garments, under body armor combat trousers, under body armor combat shirt, inner gloves, balaclava etc. The socks are engineered to provide as much multi-functionality per gram as possible. Each gram of the very comfortable Advanced Combat Socks provides cushioning, moisture wicking, ventilation, rapid drying as well as resistance to microbes, abrasion, fragments, fire, heat, and tearing. A pair of Advanced Combat Socks is over 100 grams lighter than a pair of standard issue military infantry boot socks and has far superior properties. The weight of a pair of Advanced Combat Socks is 40g for size 43-46. 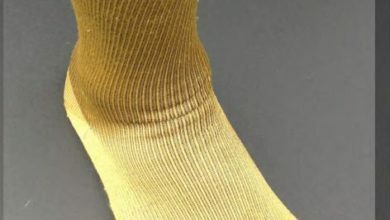 During an IED attack the Socks will provide a Greatly Increased Resistance, compared with other Socks, By Resisting: The shock wave tearing open and bursting the skin. The fragments, especially organic matter containing bacteria and fungi, penetrating the skin. On its own it will stop a 1.1gram steel fragment simulation projectile travelling at over 100 meters per second. The heat wave burning the skin and other tissue. The material exhibits biocide / antimicrobial properties that actively inhibit growth of microorganisms including bacteria and fungi that are a cause of many skin / foot health problems. UAS/2nd Skin Armor Outer Garment Single layer protection =7 times lighter clothing. Meets all USA Fragmentation (IED protection) standards. Moisture wicking, ventilation, rapid drying, cold and wet weather protection, parasites (i.e: insects, fleas, flies, lice, ticks, mites, worms, etc.) venomous animals (arachnids, reptiles, etc), Pathogens spread by contact with the local population and animals plus CBRN weapon systems. This requires materials with more than one function, and the more functions per gram of material the better. The performance of materials can be quantified in functionality per gram through the application of industry standard tests. The information only summarizes a few of the main physical properties of the yarns and textiles used in combat uniforms, body armor and load carriage systems in service within NATO. Terpolyaramides like Ruslan and 2nd Skin Armor are 5 times stronger than polyamides like Cordura and Nylon and can be stably printed. Whereas, protective apparel made from para-aramides & UHMWPEs such as Dyneema and Spectra have poor printability and a high UV sensitivity and are unsuitable for producing load carriage equipment. Knitted base layers Thermal insulation & fire protection, IED resistant pants. Insulating mid layers Protection from cold temperatures. Protective / load carrying outer layers. Cut, tear, fire resistance, IED resistance. Body Armor Fragment & bullet protection. Load Carriage Strong and abrasion resistant to carry load. Toughness / Rupture Strength of some yarns suitable for protective combat uniforms. In a report titled “Mechanical Properties of A265 Single Fiber” authored by Jaeyoung Lim, James Q. Zheng, Karl Masters and Weinong W. Chen with work performed at the School of Aeronautics and Astronautics, Purdue University, West Lafayette, IN, USA that “in terms of tenacity, the average dynamic tensile strength is 59 g/denier (compared to 42 and 30 for Zylon and Kevlar fibers). This quasi-static and dynamic tensile strength measured at high strain rates (up to 2,000m/s) showed that terpolyaramides, in particular UAS/2nd Skin Armor could absorb twice the energy per unit of mass compared with para-aramid Kevlar KM2. It was subsequently found that through the use of an Instron machine using the ASTM D2256 test “Tensile Properties of Yarns by Single Strand Method” that the calculated rupture strength of the yarns was a very good match, within 10%, to the higher strain rate testing reported in “Mechanical Properties of A265 Single Fiber”. The key properties for IED resistance are thermal resistance and toughness (rupture strength) of the yarn. After the PBO / Zylon hydrolysis scare in the mid-00’s a number of independent tests were done to access the risk of loss of strength over time. During the evaluation of UAS/2nd Skin Armor by the US DoD, PEO Soldier / RDECOM/ NSSC commissioned a hydrolysis study at the University of Delaware. A report was published titled “The effects of environmental conditioning on tensile properties of high performance aramid fibers at near-ambient temperatures” authored by A. Abu Obaid, J.M. Deitzel, J.W. Gillespie Jr and Dr J.Q. Zheng. In summary, it stated that at the most extreme conditions of 212F, 34 days, aramid fibers showed significant loss of tensile strength (58% for Kevlar KM2, and 34% for Twaron), while a reduction in tensile strength of 13% was observed for aramid copolymer (UAS/2nd Skin Armor) fibers. The differences in molecular architecture and phase morphology, the aramid copolymer UAS/2nd Skin Armor , are less susceptible to degradation of tensile properties under these conditions. This data was similar to previous tests. Interestingly, in routine quality control testing, of in service body armor vests, the following data was obtained for vests made of Rusar yarn. Rusar has now been replaced in production at Kamenskvolokno by Ruslan. Kamenskvolokno also produces two other yarns Artec and UAS/2nd Skin Armor . Due to the concerns raised by potential end users of the use of an “aramid” yarn in outer garments that are exposed to sunlight, testing was carried out by Coats Plc as part of their evaluation of terpolyaramides, in particular UAS/2nd Skin Armor , for use in outer garments. The accelerated weathering test (QUV) was carried out in accordance with the ISO 4892 test protocol. Accelerated weathering simulates damaging effects of long term outdoor exposure of materials and coatings. This test was surprising as the chemistry of the family of terpolyaramides, that UAS/2nd Skin Armor is a member of, comprises approximately by mass 50% of the para-aramid PPTA and 50% benzene ring not dissimilar to the benzene ring chemistry of PBI that does not suffer from UV degradation. PBI has not been included in this study due to the very low strength of the PBI fibers. To estimate the “Dismounted Soldier Days Equivalent” the methodology was taken from the NIST Technical Note 1746 “Accelerated Weathering of Firefighter Protective Clothing: Delineating the Impact of Thermal, Moisture, and Ultraviolet Light Exposures” by Shonali Nazaré, Rick D. Davis, Jyun-Siang Peng, Joannie Chin. http://dx.doi.org/10.6028/NIST.TN.1746 This was estimated for a tropical arid region like Afghanistan and Iraq where the solar isolation is around 6.5 KwH/m2/day. This assumes the soldier is wearing one outer uniform per annum, however, on operations they would have two or three outer uniforms for dismounted infantry and Special Forces. The team, using this information, set about developing a printing process for terpolyaramide, in particular UAS/2nd Skin Armor . Aramids are known for their very low chemical reactivity and surface energy that is less than 10 dyne/cm and are thus very hard to print in deep stable colors. A primary function of a combat uniform is to reduce the visual signature of the wearer. UAS/2nd Skin Armor has a color stability very close to polyamide (Cordura / Nylon, etc). UAS/2nd Skin Armor textiles have passed Oekotex 100 Level 2 testing which is a test to see if a material is safe to wear next to the skin. However, in field trials of UAS/2nd Skin Armor base layer garments, including socks, the material exhibits biocide / antimicrobial properties that actively inhibit growth of microorganisms including bacteria and fungi that are a cause of many skin / foot health problems. US Navy Cmdr. Carlos Rodriguez, who has led investigations into the infection of soldiers, by common fungal organisms including Mucor and Aspergillus terreus, caught in IED attacks states the infections, “can take days or weeks to positively identify them. Doctors have gotten better at identifying the fungus, but the answer lies in killing or cutting out spores before they infect.” UAS/2nd Skin Armor textiles actively inhibit microbial growth and are safe to wear next to the skin for extended periods of time. In some textile applications, load carriage para-aramids have great strength but yarn thickness is a limiting factor. Kevlar 22 Tex being the finest commercially available para-aramid textiles can only be woven down to 100gsm vs 50gsm from a 6 tex terpolyaramide and when you produce 15 fabrics this fine for aramids other factors come into consideration such as abrasion and tear resistance not just tensile strength. UAS/2nd Skin Armor can be processed with a PEEK or phenolic resin system to produce composites with more than twice the strength of carbon fiber. This composite can be used to manufacture ultra-light weight frames, masts & antenna, radio, ECM, electro-optic cases, motherboards, tripods, base plates, butts, the list goes on… if it can operate at under 482oF/250oC or conduct electricity then it can most likely be made 50% lighter using UAS/2nd Skin Armor . Threats from IEDs and MEs are blasts characterized by primary and secondary effects; high pressure wave and secondary impacts, the primary and secondary fragments and the primary and secondary heat. This section shows how and why high performance materials are required to best protect combatants. 2nd Skin Armor is an advanced terpolyaramide fiber tested by many governmental organizations including; DSTL, CREAL, DGA, US DoD. Purdue University testing funded by DoD showed the average dynamic tensile strength of UAS/2nd Skin Armor is 59 g/denier (compared to 42 and 30 for Zylon and Kevlar KM2 fibers). 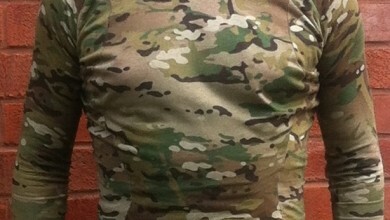 2nd Skin Armor can be very stably printed in long lasting military camouflage colors and patterns. Testing at Chesapeake Test Centre this year showed a very breathable single layer of UAS/2nd Skin Armor material (140gsm) meets the US Army SPS “Base Level” fragment resistance requirements of 700 fps for the 2gr RCC (actual 895fps) and the V50 for the 17g FSP was 706). UAS/2nd Skin Armor is stable to 500oC / 1,000oF and has enhanced cut, tear, etc. protection properties. To resist the primary blasts wave, a very high strength / tough material is needed to be worn that stops the skin from tearing apart. To stop the skin being seared / burnt a material with very high strength at elevated temperatures is needed which can also provide a short term insulating effect. Aramide fibers are known to have high thermal resistance compared with other polymers and naturally occurring fibers. They have a limiting oxygen index number of over 25% ensuring they do not burn in air and they have good strength retention at high temperatures. Terpolyaramides can be produced with very high LIO resistance; however, the standard 35% LOI is more than sufficient. The thermal resistance is similar to para-aramide that is greater than meta-aramides which in turn are far superior to fire resistant treated viscose and cottons. Compared with chopped spun yarns, continuous filament yarns made from terpolyaramide have approximately twenty times greater strength then textiles made from chopped spun yarns currently in use in combat uniforms. Between 2005 and 2009 we engaged with the US DoD in development of a terpolyaramide fiber, textile based fragmentation protection body armor. The testing data was for a package that was developed in 2008 and one in 2011 that illustrates an increase in specific energy absorption of a specific fiber against deformable 9mm bullet and fragments. During the testing with the US DoD, a range of spinning conditions, filaments, weaves and treatments were used to provide a weight saving of approximately 30%. This work has been going on continuously with a number of NATO countries. It was decided, in 2010, having seen the effect of the weight reduction for the US DoD on the IOTV vest testing, to see what level of protection just one and two layers of 2nd Skin Armor could provide within a combat uniform. Initial testing was done at Helston Gunsmiths ballistic laboratory at Water-Ma-Trout, Helston, Cornwall TR13 0LW, United Kingdom, Phone: +44 1326 561440. In accordance with STANAG 2920 test protocols, with FSPs that were machined by Helston Gunsmiths to keep the mass and cylindrical diameter of each projectile as similar as possible to the 1.1g whilst varying the length, thus volume, as the density of the tested materials varied considerably, as did the strength and hardness. The chamois used as a skin simulant was 500 grams/m2 +- 10 gsm. The spun polyester cotton was 195grams/m2 with a standard STANAG 2920 air clamp. The results in terms of energy absorption per gram (joules/lb/sqf 2) showed us there was 5 to 10 times more energy being absorbed with continuous filament woven fabrics then yarns made from chopped spun fibers. Increase in specific energy absorption of one and two layers of a terpolyaramide based textile woven from 29.4 tex yarn, in a plain weave, 160gsm when compared with a standard NATO issue poly-cotton combat uniform material. This data shows there was a significant increase in the specific energy absorption of the materials. To able to measure the V50 accurately of layers of materials with only 100 grams / m2 between\ them testing was done at TNO in the Netherlands in 2012 in accordance with STANAG 2920 test protocols. TNO – Netherlands Organization for Applied Scientific Research at the ballistic test center Ypenburgse Boslaan 2 NL-2496 ZA The Hague, Netherlands. The laboratory for Ballistic Research is ISO/IEC 17025 accredited and also has a NEN-EN-ISO 9001:2008 management certificate. This data shows that there is a large gain in protection to be had by using just one or two layers of materials. The next stage was to see if there was any significant difference in using a knitted fabric compared to a woven fabric. In hot countries, the thermal burden caused by woven materials lack of air permeability is significant and a knitted fabric of a similar weight to a woven fabric has approximately 10 times greater air permeability. At this time, in 2012, the US DoD had published the initial Soldier Protection System requirements that identifies specific vulnerable areas and specifies specific levels of fragmentation protection. Work continued at TNO and also at Chesapeake Test Centre in accordance with US Mil Standard 662f test protocols. Chesapeake Test, 4603B Compass Point Road, Belcamp, MD 21017. Chesapeake Testing Centre is an NVLAP Accredited (Lab Code 200820-0), NIJ Approved Test Laboratory for Personal Body Armor NIJ Standard-0101.06 and an approved RDECOM (US DoD) test facility. During this testing, a wide range of both knitted and woven textiles were tested made from a 6.3 tex, 14.3 tex and 29.4 tex yarns. A large increase in specific energy absorption between knitted and woven textiles made from 2nd Skin Armor 29.4 tex yarns was observed at lower areal densities. At one layer, the specific energy absorption of a knitted textile was double that of a woven fabric for both 2grain RCCs and 17grain FSPs. The knitted textile has 10 times the air permeability compared with a woven textile, and greater tear resistance. Knitted textiles made from the same yarns have twice the specific energy absorption then woven textiles.